I’ve tried out a couple of patterns out of the Vogue Knitting Winter 07/08 issue. 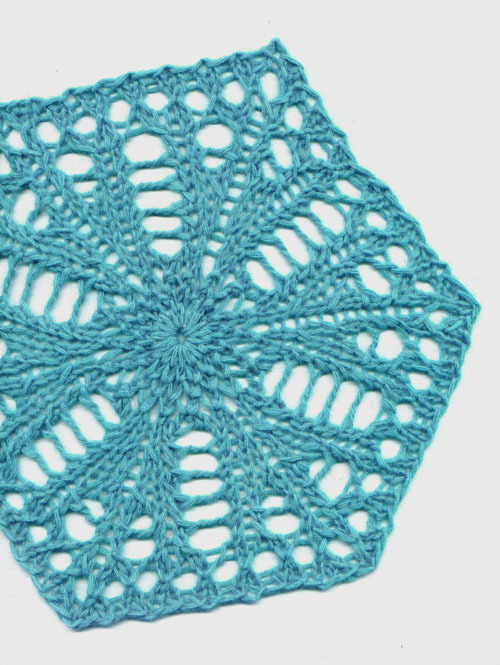 The blue lace hexagon, which reminds me of a sand dollar, is intended to be one of several sewn together to make a wrap, and is designed by Norah Gaughan. I think I blocked it a little too hard. I also knit one of the medallions which makes up the Nicky Epstein capelet, shown in the same Vogue issue. Unfortunately, sans camera I can’t post a picture of this one, which is too big to scan. 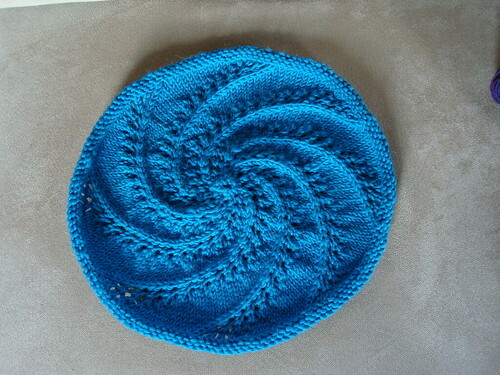 But here’s a picture of lottloft’s version, which I found on Ravelry. Mine looks about the same, only it is knit in a black chunky angora that I recycled and dyed. It’s definitely big enough to be a pillow cover, which is what these shapes inspire me to make! Or maybe an afghan?